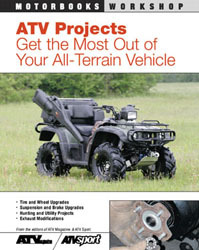 ATV Projects: Get the Most Out of Your All-Terrain Vehicle gives you the tools you need to do just that with 25 projects selected from the pages of ATV Magazine and ATV Sport. These projects include step-by-step instructions to help you replace your fading brakes, update your suspension, add heated grips, plan your next adventure ride, safely trailer your quad, and much more. Each project also lets you know the skill level you'll need to complete it, as well as how much time and money it will take to see the project through. More importantly, these projects will help you get the all out of your all-terrain vehicle.